The dollar advanced for the second consecutive session against most of its peers on Thursday, as investor risk sentiment remained shaky. Home » Forex » The dollar advanced for the second consecutive session against most of its peers on Thursday, as investor risk sentiment remained shaky. Meanwhile, Investors will also be awaiting third-quarter U.S. GDP data that is due out on Friday for further dollar cues. If US GDP reading comes in below expectations, this could trigger investors worries regarding economic growth and raise doubts whether that could possibly lead to a change in the U.S. Federal Reserve’s monetary tightening path. 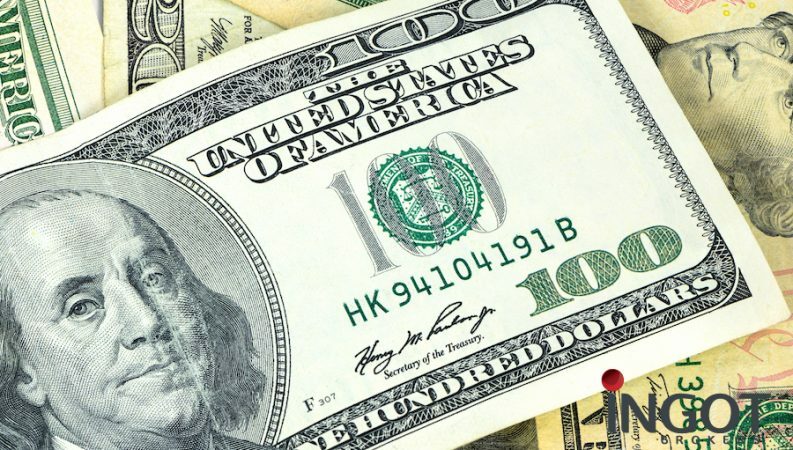 The U.S Dollar index rose versus a basket of six major currencies on Thursday to end the session at 96.60, The gains in the dollar index were mainly due to the losses in the single currency, which has more than 60 percent weighting in the index. Over in Europe, The Euro tumbled to near 2-month lows on Thursday versus the dollar to settle at 1.1374 EURUSD at the close. The Euro touched a two-month low of 1.1353 after ECB President Mario Draghi was unsuccessful in convincing market participants that the central bank could pursue monetary tightening after next summer as political and economic uncertainties grow in the monetary union. Additionally, The ECB confirmed that it would end its 2.6 trillion euro ($2.97 trillion) asset purchase program this year, and that interest rates could possibly start hiking rate after next summer. Over in the United Kingdom, the Great British Pound tumbled versus its American counterpart to trade at 1.2815 at the close. The cable fell following Draghi’s comments that the private sector needed to prepare for the possibility that negotiations regarding the divorce with Britain could end up with a no deal on future relations. In terms of Safe-havens, the greenback was regained some lost ground versus its Japanese counterpart to close the session at 112.40 USDJPY as risk appetite made a cautious return, The Japanese currency yen tends to fall as confidence improves in financial markets. Meanwhile, the U.S Dollar advanced versus the Swiss franc trade at 0.9989 USDCHF. The precious metal Gold slightly eased against the greenback on Thursday to close at 1232.12 XAUUSD per ounce. In terms of commodity-currencies, the greenback edged up versus the loonie dollar to end the session at 1.30559 USDCAD. Meanwhile, in Asia, the Aussie and Kiwi dollar traded on mixed territories against their American counterpart, The AUDUSD rose to trade at 0.7078 AUDUSD and NZDUSD edged lower to trade at 0.6515 NZDUSD at the close, respectively. In Cryptocurrencies, Bitcoin, Ethereum and Litecoin were all tradings at unchanged levels on Wednesday versus the Greenback to settle at 6374 BTCUSD, 197.37 ETHUSD, and 50.04 LTCUSD. Grain commodity futures’ ended Thursday’s session in the red territories, as Corn and Wheat prices fell significantly after USDA’s export report on Thursday morning.